KMS Plastic Pillow Blocks are made from engineering grade glass filled PBT polyester and are completely interchangeable with conventional cast iron blocks. These maintenance free blocks have excellent mechanical strength, stiffness and dimensional stability, and never rust or corrode. 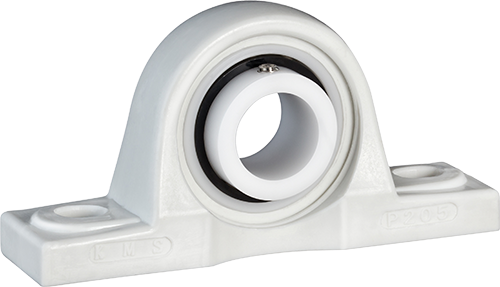 Pillow blocks are foot mounted units that are used to provide shaft support when the mounting surface is parallel to the shaft axis. The mounting holes are slotted for ease of mounting adjustment. 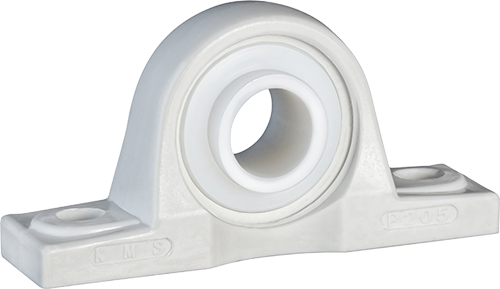 KMS Plastic Pillow Blocks are made from engineering grade glass filled PBT polyester and are dimensionally interchangeable with conventional cast iron blocks. Polymer Pillow blocks are currently being used in many industries including food processing, bottling and packaging machines, chemical processing, and pool and marine applications. 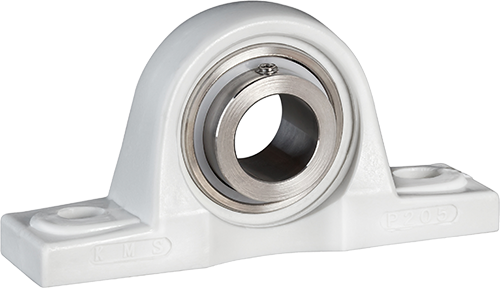 KMS Pillow blocks can be purchased with a variety of KMS insert bearings to best suit your specific application.